Home blog CIH fall protection falls HASP industrial hygiene Industrious Hygienist national safety month NSC OSHA PPE slips trips What is OSHA doing about fall prevention? 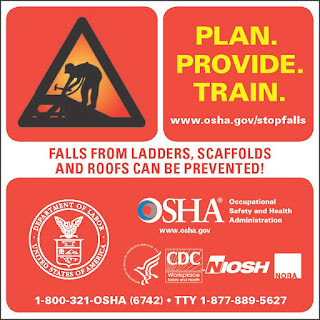 What is OSHA doing about fall prevention? OSHA's outreach program includes images, posters, wallet cards, etc. that employers can use to educate themselves and their employees. "When working from heights, such as ladders, scaffolds, and roofs, employers must plan projects to ensure that the job is done safely. Begin by deciding how the job will be done, what tasks will be involved, and what safety equipment may be needed to complete each task. When estimating the cost of a job, employers should include safety equipment, and plan to have all the necessary equipment and tools available at the construction site. For example, in a roofing job, think about all of the different fall hazards, such as holes or skylights and leading edges, then plan and select fall protection suitable to that work, such as personal fall arrest systems (PFAS)." "Workers who are six feet or more above lower levels are at risk for serious injury or death if they should fall. 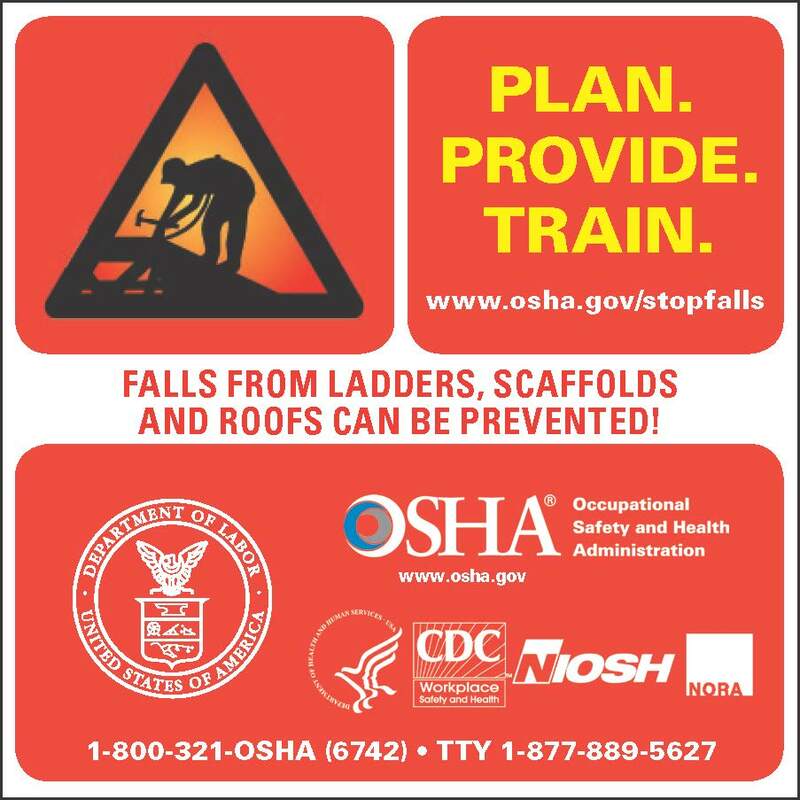 To protect these workers, employers must provide fall protection and the right equipment for the job, including the right kinds of ladders, scaffolds, and safety gear. Different ladders and scaffolds are appropriate for different jobs. Always provide workers with the kind they need to get the job done safely. For roof work, there are many ways to prevent falls. If workers use [PFAS], provide a harness for each worker who needs to tie off to the anchor. Make sure the PFAS fits, and regularly inspect all fall protection equipment to ensure it's still in good condition and safe to use." "Falls can be prevented when workers understand proper set-up and safe use of equipment, so they need training on the specific equipment they will use to complete the job. Employers must train workers in hazard recognition and in the care and safe use ladders, scaffolds, fall protection systems, and other equipment they'll be using on the job." OSHA has provided a bunch of educational materials and resources, training resources, and media resources (images, press releases, etc.) so that employers can be aware of their responsibilities to their employees regarding falls. Another example of the media available for use from OSHA to train and educate employees, or just serve as a visual reminder on a job site.